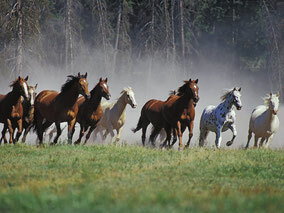 Horse Connections - Website of Horse Connections! Welcome to the Horse Connections website! To sign up for the Horse Connections online magazine, click here and at the beginning of every month the newest issue will be delivered directly to your email inbox. 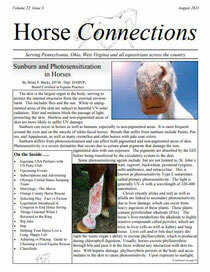 Horse Connections started as a four-page black and white monthly publication in June 2000 distributed in the tri-state area (western Pennsylvania, northern West Virginia and eastern Ohio) and has now grown to a multi-page, full-color digital publication that is accessible to even more horse lovers in any location, at any time, on any type of device that is connected to the Internet. Congratulations to Katie Finley of Wexford, PA, for winning the 2018 Horse Connections Top Junior Rider Trophy at the Mountaineer Hunter Jumper Association Endless Summer Horse Show August 10 - 12 at the WPQHA Show Grounds in Harlansburg, PA.
She is shown here with her pony, Crocodile Rock, and with her trainer, Chelsie Stair, of Candy Lane Acres in Franklin Park, PA.